March 19, 2014 Frontpage Comments Off on Are Atheism And Conservatism Compatible? By DEXTER DUGGAN Radio talk host Barbara Simpson had a copy of The Wanderer up on the glass window between her San Francisco studio and the adjoining control room when I stopped by KSFO in January to report on the day’s pro-life Walk for Life West Coast, which marched down nearby Market Street. From its 11th-floor location, “Hot Talk KSFO” (560 AM) is a neighbor to the city’s financial district — where the iconic Transamerica Pyramid building looms — and about a 25-minute walk from the Ferry Building on San Francisco Bay. Simpson repeatedly lauded The Wanderer on the air, mentioning that a listener introduced her to the paper, which she hadn’t known about, with a gift subscription years ago. March 15, 2014 Frontpage Comments Off on What Would The GOP Do? By MITCHELL KALPAKGIAN The Romance of Religion. By Dwight Longenecker (W Publishing Group: An Imprint of Thomas Nelson: Nashville, Tenn., 2014, 221 pp.). $15.99. Available through SpecialMarkets@ThomasNelson.com or www.amazon.com. This is a lively, robust book that is as profoundly serious as it is lighthearted and mirthful. In short, crisp sentences that ring with a cheerful human voice and a playful, witty intelligence, Fr. 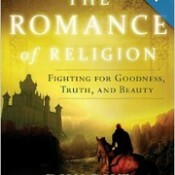 Dwight Longenecker glances at the human condition, the classics of literature, and the familiar stories of the Bible with a human wisdom that engages and fascinates as it explains the importance of religion as a “romance,” a term rarely attributed to this body of knowledge that is commonly viewed with only high seriousness and solemn piety. By JOHN YOUNG I heard a priest declare in a homily that in the days before Vatican II that Scripture reading was a “no-no” for Catholics. Other Catholics, whether clerical or lay, while not going that far, believe that the Church before Vatican II didn’t encourage lay people to read the Bible. Frank Sheed, in his book The Church and I, published in 1974, states that even the committed laity, before the Second Vatican Council, “…saw theology as all-sufficient, Scripture as a quarry from which we could dig out supporting texts” (p. 288). According to Sheed, Catholics in general simply didn’t appreciate Scripture as something that should permeate their lives and vitalize their theology.